Wall mount. For use in pass through applications, enabling more operatory stations. - Standard, short or long extension Arm, to fit all your requirements. - Sturdy, Positioning Arm with a long reach. - Ease of positioning and drift free stability. 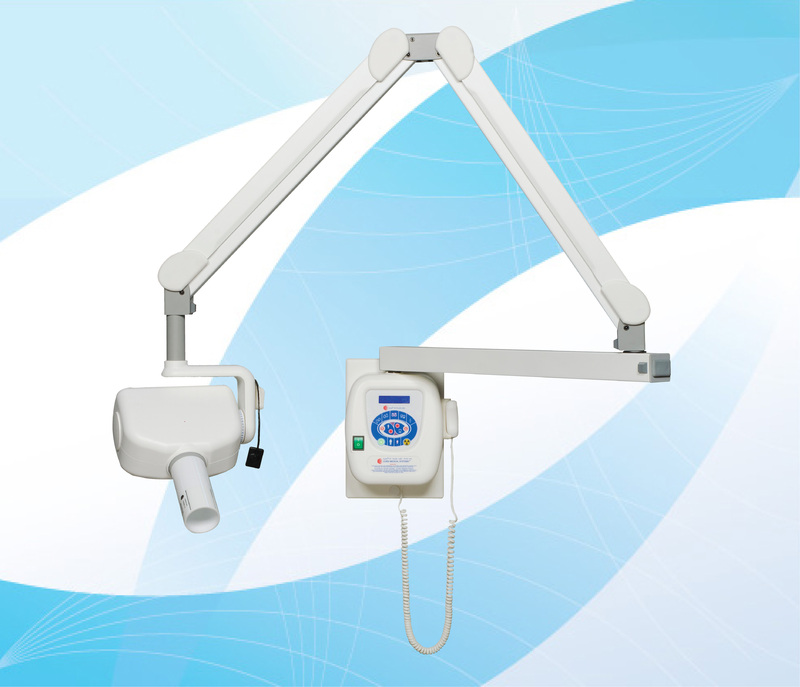 - 70 KVp Tubehead, Assures high quality, sharp, and well-defined images in intra-oral radiography by using the most reliable x-ray tube available in the market. RATED TUBE CURRENT: 8 mA +/- 15% @ 120 V. a. c.
EXPOSURE TIME RANGE: 0.03 to 3.00 s., in steps of 0.01 s. Plus 27 pre-set exposure times, with automatic main voltage compensation. Four different Pre-heating times pre-selected by the user are available for loading the x-ray tube (Pre-heating time is not shown on the display). RADIATION LEAKAGE @ 1 m. : Less than 50 mR/h (Technical Factors: 70 KVp, 8mA, 1s). NET WEIGHT: Mod. WM (Wall Mount): 29 kg. Mod.MM (Mobile Stand): 41 kg. SHIPPING WEIGHT: Mod. WM (Wall Mount): 34 kg. Mod.MM (Mobile Stand): 47 kg. SHIPPING DIMENSIONS: Mod. WM (Wall Mount): 1 Box, 131 x 53 x 26 cms. Mod.MM (Mobile Stand): 2 Boxes, 111 x 34 x 25 cms., and: 87 x 38 x 33 cms.